Using social networking to sell a product is an avenue which has been fully exploited since Facebook came to prominence. Hundreds of multinational companies now use the site to keep consumers in the loop, often inundating inboxes and home page feeds with news on costs, features and release dates. The introduction of Twitter naturally had a similar effect, albeit in a much more streamlined way. Celebrities are now just a click away, for better or worse, and this gives both consumer and product an immediacy previously unattainable. For a stand-up comedian, however, the micro-blogging service can offer a deluge of options not just in marketing and promotion, but also in the development and refinement of an act. Comedians are now using Twitter to establish stage persona and even trial jokes, using reactions and retweets during the day to judge the strength of a gag, then trying it out before a live audience that night. Gary Delaney (@garydelaney) is a well-respected one-liner comic with television writing work to his name, and has tweeted quips to his impressive 20,000 readership as one way of judging a joke's worth before taking them to the stage. He says: "One big advantage of Twitter is the instant feedback you can get on a joke; you can go from initial idea, to wording, and posting the joke, to watching it get RT'd (or not) all within two or three minutes. Shutting myself away in my office with a blank piece of paper to come up with ideas to test at a later date never seems quite as appealing in comparison." Before Twitter, it was common for comedians to set up a website or mailing list to help get their name out there. While an online presence is useful, it usually only preaches to the converted. With Twitter, the middle man is cut out. Indeed, Delaney credits the tool with helping him build a strong fanbase and attract people to his shows – something he believes wasn't possible from the standard mailing list or website approach. "Twitter has always had one big advantage for me, namely the convention that when someone retweets a joke they credit the original author. Thus people will end up following you because they like your jokes and then maybe come and see you live. With Facebook, mailing lists etc people will only join up if they have already seen you live. This is very handy if, like me, you're a good joke writer but with minimal TV/radio exposure, because you can reach your potential audience direct." However, Delaney freely admits that he has become a victim of his own Twitter success. Last year, television star Keith Chegwin was taken to task by a number of stand-ups after stealing jokes they had previously written and tweeted. "As the number of people on Twitter increases," he says, "idiots start cutting and pasting jokes they like instead. There are lots of accounts who just take other people's jokes and retweet them as if they were their own. This may represent the moment when Twitter jumped the shark and its value to comics started to decline." Now Delaney subscribes to the belief that Twitter is best used for marketing and building a fanbase rather than a straightforward gag tester, going as far as to attribute a quarter of the ticket sales for his Edinburgh Festival show to the service. But that doesn't mean that his account is joke-free, far from it; Delaney now sees the value in posting 'exclusives' that won't see the light of day on stage. "Twitter audiences are generally a lot cleverer than comedy club audiences so you can get away with a wider range of material. It gets marketing value from material that otherwise would go unused." While it makes perfect sense that the average Twitter user would want to follow a stand-up, it's not quite so simple for promoters. Lee Martin set up Gag Reflex (@gag_reflex) in 2004, and has nurtured it into one of the biggest comedy agencies in the north west. 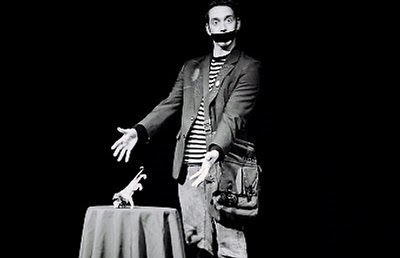 This year alone has seen two of his acts, The Boy With Tape On His Face (@tapefaceboy - a mime artist who tweets in Morse code!) 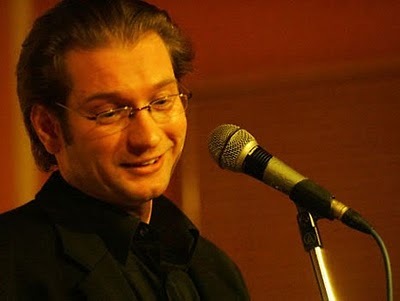 and Steve Shanyaski (@steveshanyaski), appear on ITV's Comedy Rocks and generate much interest online. A curious Twitter search on the night of Shanyaski's performance opened his eyes to the potential for marketing his acts, and his company, using the service. "The Twitter response to Tape Face and Shanyaski was astounding," he says. "People from all over the UK were tweeting about them for days after their performances. Of course, television will always generate word-of-mouth interest but with Twitter it can be quantified, so we could personally thank them for their feedback and invite them to follow us and the acts. The audience was clearly there to get in touch with and inform whenever the two performed around the country." "I try to my hardest to keep the official Gag Reflex account from being too dry. Nobody wants to follow someone who is constantly trying to sell them something. So I reward followers with pictures of acts live on stage, daft stuff, and tweets about what I'm up to as well as the promotions and offers for shows." Just like a multinational company promotes its wares, the comedy industry is slowly coming around to the idea of Twitter as a quick, easy and very accessible marketing tool. And as mobile internet ascends, this trend shows no signs of dying online. Those who make a living from comedy, both on-stage and off, should look to reap the rewards this unique method of audience interaction offers.